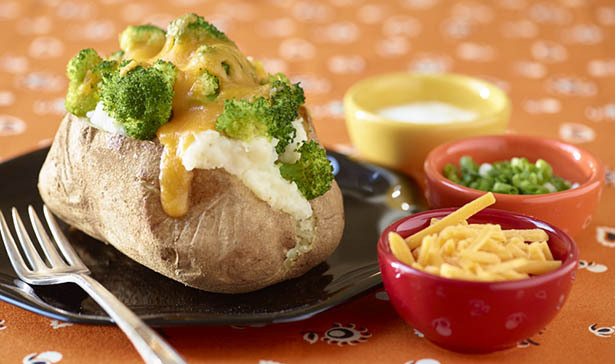 Dress up a plain baked potato by stuffing it with cheese, steamed fresh veggies and yogurt. Cut a lengthwise slit in top of potato. Carefully scoop out potato, leaving about 1/4 inch of pulp inside the shell. Mash removed potato in a medium bowl. Add yogurt and black pepper to mashed potato. Place potato shells on baking sheet. Spoon mashed potato mixture back into potato shells. Top with steamed vegetabls and cheese. Bake 10 to 15 minutes or until thoroughly heated.